I was asked the other day why there hadn’t even so much as been any noise on the Yankees trying to find a new shortstop. It was a known wide-open hole, and it didn’t seem like any negotiations had developed. But, sometimes, things come together quickly. Other times, things come together slowly, and we just don’t hear about them in the lead-up. The Yankees now have their new shortstop, and it’s a player who’s been rumored to be available for a while. Yet what we don’t have is a two-team straight-up player swap. The Yankees are getting Didi Gregorius, who’s long been a candidate to fill the vacancy, what with Arizona also having Chris Owings. But this is a three-team trade, with the Tigers involved, and they’re getting Shane Greene from New York. Finally, the Diamondbacks are getting Robbie Ray and one Domingo Leyba, both from Detroit. It’s a trade full of second-tier intrigue, and I think the best way to do this is to discuss the move by breaking it up into team-specific sections. It seems to me like the Yankees did well, and the Tigers did well, too. The Diamondbacks are taking the biggest risk. There’s a lot of team control getting swapped around. Everyone’s getting something that could be a part of the long-term future. Onward! For the Yankees, it’s Gregorius for Greene. They lose a year of service time, and Gregorius will cost millions before Greene will, but these are lesser considerations, and also, it’s the Yankees — they can afford it. It comes down to getting a shortstop with questions for a pitcher with questions. Both are big-league caliber players, but given the relative risks, it makes sense to take the position player over the arm with only a short record of success. Somewhat famously, Kevin Towers once drew parallels between Gregorius and Derek Jeter, so in that way it’s fitting that Gregorius will serve as Jeter’s replacement. Gregorius and Jeter don’t actually have that much in common, but then Jeter’s one of the best shortstops ever, and Gregorius is capable of starting. While Jeter, clearly, represents an offensive threshold Gregorius will never approach, Yankees fans who grew accustomed to Jeter’s defense will suddenly start noticing fewer base hits to center and left. Defense is Gregorius’ greatest strength, even if it hasn’t necessarily shown up yet in the numbers. His reputation exceeds his statistics, and while historically that burned us in evaluating a young Yuniesky Betancourt, Gregorius has all the physical skills to be a plus shortstop in the field. It’s safe to consider him at least average, and probably better, and he’s very quick on his feet. The Fan Scouting Report results have been fond of him; he just ranked tied for being the sixth-best shortstop. He’s credited with having a strong arm and consistent, steady hands. As with so many talented defensive infielders, the questions are about the bat. Gregorius owns an 84 wRC+, projecting for 86. He makes only an average amount of contact, and somewhat surprisingly he’s been a fly-ball hitter. He’s neither patient nor a hacker, and all of his power exists to the pull side. But that’s a good thing for him in New York, with right field beckoning, so Gregorius should have a fine transition to the ballpark. It’s worth noting that Gregorius has been mostly acceptable against righties, but he’s been a mess against southpaws. It’s way too early in his career to make too much of that, but in the season ahead, the Yankees could spell Gregorius sometimes with Brendan Ryan, without losing anything in the field. An issue is that Greene projected to be a member of the Yankees’ starting rotation. So one hole has been plugged and another has now been opened. But there are more pitchers available than there are shortstops, especially promising long-term shortstops, and the Yankees can afford to take on extra pitcher salary if they want to. In the big-picture view, Greene is only a few months removed from seeming like a non-factor, so the Yankees did well to turn a new asset into a needed asset. While it’s Gregorius who will attract the most attention in this move, Shane Greene is probably the most interesting player. At least, he’s the most interesting player to me. Never before considered a prospect, Greene joined the Yankees in 2014 and immediately showed big-league stuff, starter stuff, with the variety of pitches to stick. The Tigers were in need of a better fifth starter than Kyle Lobstein or Robbie Ray. In Greene, they’ve found one, as bewildering as that might be. Here’s the simplest way to put things. Greene owns a minor-league ERA over 4. He owns a Triple-A ERA closer to 5. He doesn’t have a long history of missing bats. But in the majors, among starters, Greene just ranked in the top 25% in groundball rate. He ranked in the top 20% in strikeout rate, and he also ranked in the top 20% in average fastball velocity. Once you have a remarkable big-league performance, how much stock do you put in the numbers against minor-league competition? Matt Shoemaker owns a Triple-A ERA of five and a half. He just finished as the Rookie of the Year runner-up. So how much should we care about the minors? About that changeup: Greene didn’t throw it a ton, so he seems like a sinker/slider kind of righty. But he also has that cutter, and when he did throw changeups, he located them pretty well, suggesting that perhaps the pitch isn’t a weakness. Maybe Greene isn’t actually doomed to a career of big platoon splits. 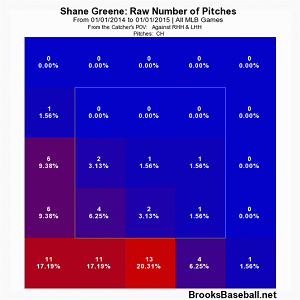 If Greene succeeds in elevating a bit more, it would also be good for his pitches down. Plus, it would give him another weapon against lefties. Last year, righties whiffed 23% of the time they swung at a Greene fastball. Lefties had a rate of just 5%. Lefties are good at tracking right-handed sinkers, so Greene could offset that not only with more changeups, but also with four-seamers upstairs. It’s reason to believe Greene might get even better. But just looking at what Greene actually did, he had a better-than-average ERA, a better-than-average FIP, and a better-than-average xFIP. He also threw better-than-average stuff, so it’s not hard to make the case he’s at least something like an average starter, with upside. An average starter with upside, and six years of team control? That’s a valuable asset. The Tigers don’t have a lot of valuable, long-term assets. Greene’s one, now, and while it’s possible he becomes irrelevant as quickly as he became relevant, you believe in the pitches. And it’s the pitches that make the pitcher. We weren’t all dreaming those 94 mile-per-hour sinkers. We weren’t all dreaming the location. To get Greene, the Tigers gave up on a pair of prospects. You could say, then, they exchanged two potential long-term assets for one. But the one has much higher odds of actually working out, and he’s got six years to go, beginning with a year in which the Tigers intend to win. Mike Russell, recently hired as special assistant for D-Backs, had been in DET organization, so he knows the 2 prospects they got very well. Obviously, a year ago, the Tigers must’ve been mighty high on Robbie Ray, to justify getting him as the centerpiece in the Doug Fister trade. But Ray’s stock only went down in 2014, and though there’s promise here in what the Diamondbacks are getting, they’re getting the least-sure things. Gregorius is an almost sure big-league shortstop. Greene is an almost sure big-league starter. Ray and Domingo Leyba are simply sure prospects. The Diamondbacks had initially rejected a Gregorius for Greene trade until the Yankees got the Tigers involved in the deal. I’d rather have Greene, but I suppose that’s me. The focus here is going to be on Ray, because he’s the prospect people have talked about before. He ranked in the Baseball America top-100 a year ago. But a few weeks back, BA ranked its top ten Tigers prospects going forward, and Ray was seventh, while Leyba was fifth. That indicates good things about Leyba. That indicates bad things about Ray. Ray did well in reaching Double-A in 2013, but last year he was only mediocre with Triple-A Toledo, and he allowed almost as many runs as he had innings in the bigs. At 23, he’s young, and he owns a pretty solid changeup to go with his fastball, but his fastball isn’t a true swing-and-miss pitch, even though he throws it upstairs, and he still doesn’t have a great breaking ball. Ray’s stock has dropped justifiably, and right now he’s not a major-leaguer starter. He could become one, but he doesn’t come with a tremendous ceiling. The Tigers must’ve loved something a year ago, and that something can’t have totally disappeared, but Ray was a weird return before he struggled. So there’s Leyba, to try to balance things out. He’s about the same age as Franklin Barreto, who was an exciting acquisition by the A’s in the Josh Donaldson trade, but Barreto’s the better prospect. Leyba just ranked fifth in a thin Tigers system. Barreto ranked fifth in a better Blue Jays system. Not long ago, the Tigers spent $400,000 to sign Domingo Leyba, and they spent $420,000 to sign Willy Adames. Adames is the guy people forget about when they discuss the David Price trade. Both Adames and Leyba are 19, and they’re both shortstops, but Leyba’s also spent time at second, implying Adames’ defensive tools are preferred. These two are similar prospects, but Adames, again, is better, having just ranked No. 1 in the Rays’ system according to BA. Leyba’s a good player to have in the system, and he’s probably a more valuable player to have than Robbie Ray, but Leyba’s upside might be an infielder with similar value to Gregorius. The Diamondbacks must see more in his tools. Between Arizona and Detroit, there’s an interesting matter of prospect pedigree versus results. Ray has been considered a pretty good prospect. Leyba is considered a pretty good, toolsy prospect. Greene was never a prospect, but he’s done what neither Ray nor Leyba have — he’s looked real good, with skills to match, against advanced competition. For that reason, I prefer Greene, especially since he can help today and for the next six years. I don’t think Arizona got ripped off, since Ray and Leyba have talent and Gregorius is only so valuable, but if I had to pick the worst exchange, I’d see it as Arizona’s. And I like this a lot for Detroit, even though New York also got something it needed. Gregorius and Greene — they’re fine players now. Oddly, Shane Greene might have the highest ceiling in the whole group. We hoped you liked reading Yankees Get Help, Tigers Get Help, D-Backs Get Projects by Jeff Sullivan! Underrated aspect of the deal: Gregorius’ walk-up song is gonna kill in NY.